They weren’t kidding when they said it was a heartbreaking read. I cried, I had to put it down and walk away, just to come back and cry some more. It’s an eye opening read from mother’s point of view and the son’s point of view, which the son is the addict. It is a heart pounding, adrenaline filled, and race against time the entire book. A must read! pressures of life got to him. A heartbreaking backstory is woven into both characters points of view stating the emotional turmoil both encountered from the shared experience. Beck recounts the events that took place before bringing him to this point in his life. His mother does the same thing. It’s an excellent way to deliver the truth. It’s unequivocally raw and honest. A family broken by tragedy, torn apart by guilt. Each headed down separate paths of destruction until their worlds implode. 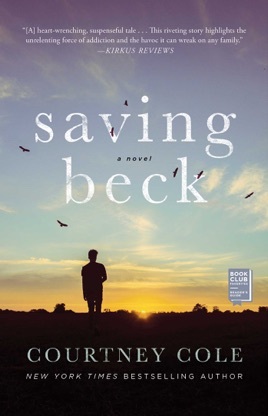 Beck is fighting for a life he’s not sure he deserves. His family and friends are by his side reminding him that he is still a good person despite the bad choices he made. This story is character driven to help support Beck and his mother. This story illustrates the various ways people cope with tragedy and how each persons choices not only effect them but effect everyone else as well. Beck recount each and every time he took drugs was scary and eye opening. with love and much support this family manages to pick up the pieces of their broken life. I loved the unconditional love and support Nat gave her son throughout this book. a reminder that you are human and you survived the battle.